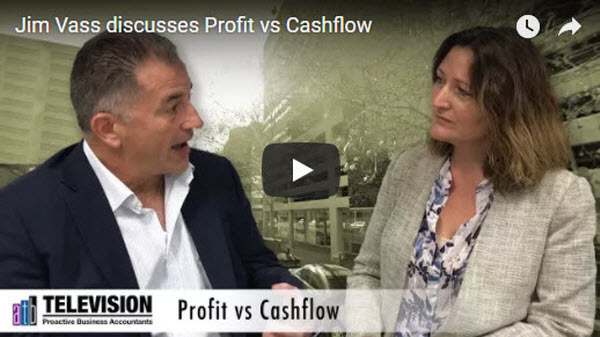 Cashflow vs Profit – what is the difference? Navigating accounting terminology can be difficult. Jim Vass from ATB Chartered Accountants explains the importance of two key metrics… profit and cash flow. Jim, understanding profit is important – there’s no point in working if you’re not making a profit right? “That’s right. Put simply, profit is income earned by a business through providing goods and services. Expenses are costs associated with earning the business income. Profit is what is left after you take your expenses from income. The issue is that just because the business is making a profit, it doesn’t mean that people are taking money home. They might go in to business and make a profit, but if they don’t control the cashflow, they might take less home than they did when they were employed. But if I’m profitable where is the money? “Whereas profit determines how much tax needs to be paid, cashflow ensures that funds are available to pay taxes and other items when they are due. What is it about cashflow that can mean there’s no money in the bank? “Poor cashflow doesn’t necessarily mean poor profit. It can result from the acquisition of assets, a quick reduction of debt, a business owner’s personal spending being to high, or inadequate working capital. Cashflow is different for many businesses so it is important to understand how the cashflow of a business works. For example a café would receive the bulk of its income at the time of sale, whereas a manufacturer would incur a large amount of costs to produce a product prior to any sale being made. These cash flow holes could grow as a business scales? Is that a reason people go out of business? What can be done to manage cashflow? “The most critical thing is to have a well-prepared budget to assist with identifying what the business owner intends to achieve during the next twelve months. We at least aim for a 12 month budget. A budget should not only consider profit, it should also consider the flow of cash in and out of the business. This will highlight when any potential problems will occur and allow you to plan on how to address them. These problems include a blow out in expenses, income targets not being met and resulting cashflow requirements. Business performance needs to be constantly compared and measured against the budget in order to make adjustments during the year to help you achieve your business goals. Some people just increase their budget by 5% without much thought. But it’s better to sit down and review your core clients, and what activities are going to generate extra business. You need to review if your resources are adequate to meet the demand. When is that additional cost coming in? What’s my baseline? When am I doing these activities? When do I need additional staff or computers or equipment? How else can you keep on top of cashflow? Which is more important, cashflow or profit? How do ATB work with clients to manage this? “We work with clients on their budget, cashflow, and their projected balance sheet. Once a budget is done and prepared, you have to keep measuring it. I once heard a speaker say that a pilot takes off from Sydney to England, they don’t just see that as a straight line. They constantly monitor where they’re going, measuring and adjusting to keep them on course. A business is no different. If you know where you want to get to in 12 months time, monitor and measure constantly and you will get there. Want to know more about cashflow and profit? Contact us we’re here to help.